A walk through of the different options on your eBay integrations page and whether or not they're right for you. Your integrations page controls high level items about your eBay integration, like your account credentials, feed options, and other account-wide settings. Here's a breakdown of what you'll see when you click on eBay, broken into two sections. This is an over-arching on/off switch for your integration with eBay. If this is in "test mode", Zentail will not communicate with your eBay Account. This is the credential that Zentail uses to access your eBay. This should automatically populate after clicking the "Generate Live Token" button. This is the PayPal email address used for your eBay account. This sets a maximum inventory level that will be sent to eBay for any given product. This can be overridden on a per SKU basis. Check this and click save to select the payment, shipping, and return policies you use on your eBay account. Allows you to automatically provide feedback when someone purchases a product from you on eBay. If you'd prefer for this feedback to happen after payment check this box. If you'd prefer to wait for a positive review from the buyer before providing feedback then leave this unchecked. This is the message that will automatically be sent to the buyer if you've opted into Feedback Automation. 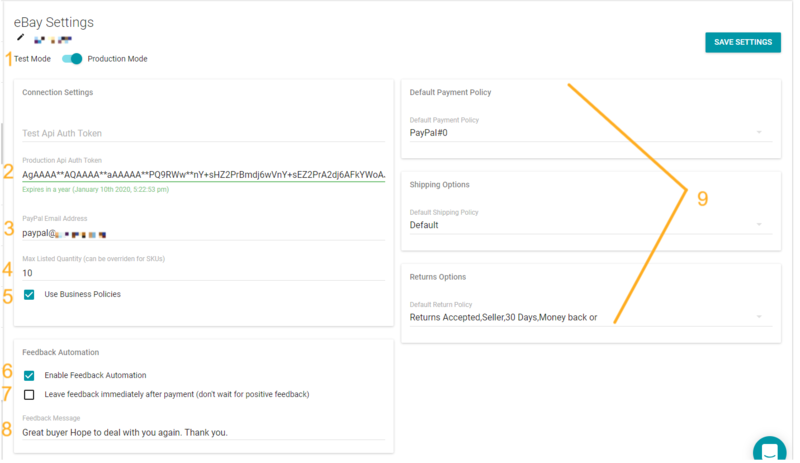 You must select a default payment, shipping, and returns policy for your eBay products. Note: This can be overridden on a per product basis. 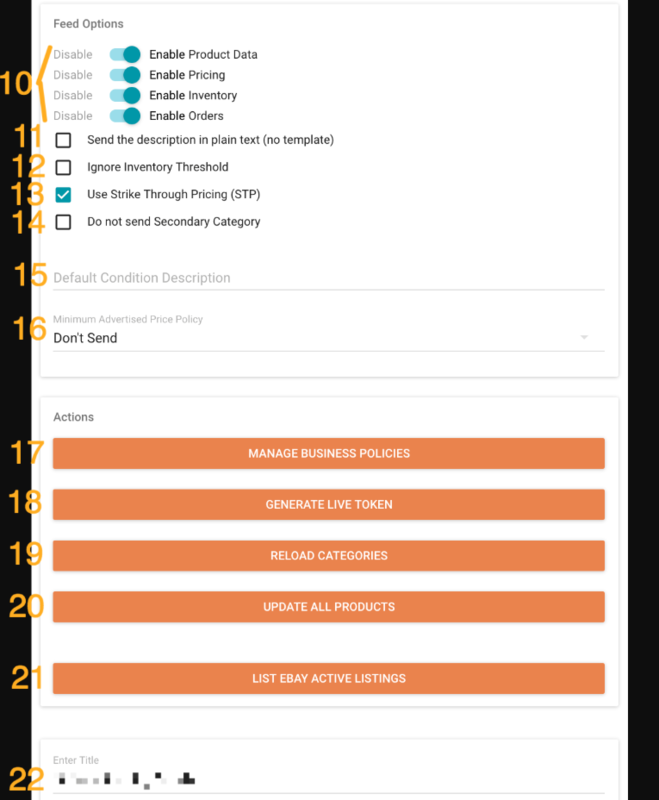 These determine whether or not Zentail is allowed to send Product Data, Price, and Inventory information for products set to list. Note: If Orders is enabled then Zentail will pull in eBay orders. Zentail has a default eBay template to help make improve the buyers experience on eBay. We recommend having this checked. Note: You do have the option of sending the description as plain text if you prefer by checking this off (not recommended). Note: Zentail is also compatible with custom eBay templates. If you check this off and have an inventory threshold, products below the threshold will still be available for sale on eBay. If your eBay account is eligible to sell a discounted item on eBay and you sell a product with an item price below the MSRP then Zentail can send your pricing information with a strike through the MSRP so buyers see a juicy deal. Zentail Smart Types have both a primary and secondary eBay category. If you would not like your products to also appear in a secondary category on eBay you can check this off. Note: Listing to a secondary eBay category is a paid feature on eBay. If you'd like your products to have a default condition description like "brand spankin' new" you could enter that here. Note: This can be overridden on a per SKU basis. Allows you to see all the business policies in your eBay account. Prompts you to log in to your eBay seller account, with will automatically provide Zentail with the credentials needed to communicate with your eBay account. If you use a custom eBay store this connects the categories you use on eBay to Zentail so you can select the correct eBay store categories for your products. Acts as an update and push for all products. This is a powerful button and should be used with caution. Please chat Zentail's support team to confirm whether or not this is needed. This will set all listable SKUs in your catalog to list on eBay. This is the name of your eBay integration for internal reference only.